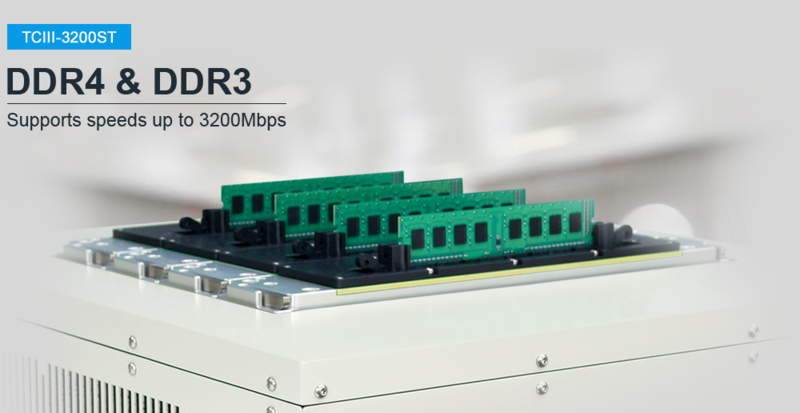 TurboCATS introduces a new line of redesigned TCIII-3200ST DDR4 and DDR3 multi-site module testing system - compact, high-performance, and equiped with enhanced productivity features. The TurboCATS TCIII-3200ST module test system features an optional 8, 16 or 64 module testing, in parallel, for high throughput on your production floor. High-end ATE's are designed to detect functional and AC/DC parametric failures but do not identify or pinpoint potential in-system failures. Most in-system failures are caused by functional and timing compatibility issues that are generated by the system chipset. Many in-system device failures occur during system boot up or during performance of a specific operation within a given system. To effectively test to include AC and DC parametric testing, most memory manufacturers incorporate a costly testing process as part of their Standard Operating Procedure (S.O.P.). One of the most difficult challenges faced by memory manufacturers is finding a cost effective method to test their products so they can minimize time to market and field failures/returns. The manpower and equipment required for the extensive testing often result in budget overruns for various cost centers. 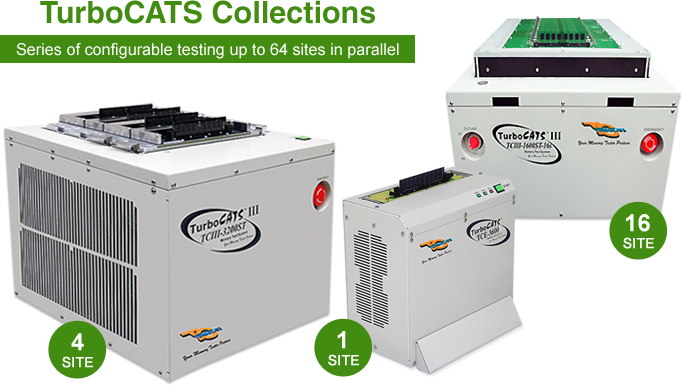 To assist manufacturers in their efforts to reduce costs, TurboCATS proudly introduces the most versatile and easy to manage TCIII-3200ST multi-site test system on the market. 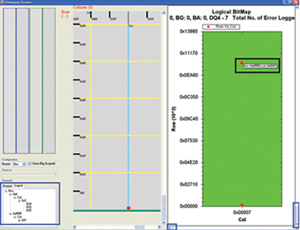 Device characterization and failure analysis tools, such as Shmoo plotting and address/data error logging, are included in the TCIII-3200ST multi-site test system to assist engineers with their design/debug processes. An optional hot temperature chamber is available to detect marginal timing and cell storage failures that often occur in high temperature system environments. The chamber is user programmable and can be set at temperatures ranging from 32°C to 85°C with 2°C resolution. Functional Failure: Cell stuck-at, coupling, neighborhood sensitivity and software error faults. Parametric Failure: (AC) Speed timing vs. Vdd threshold, (DC) Leakage and Idd's. Hot-Temperature Failure: System high temperature environment. 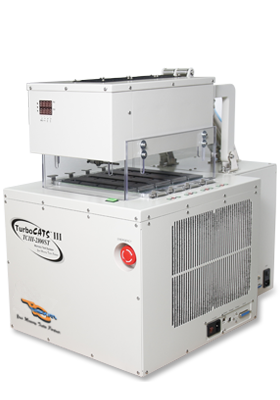 TurboCATS can meet all of your testing needs while keeping costs to a minimum. Testers are available in 8, 16 or 64 sites configuration, in parallel testing. 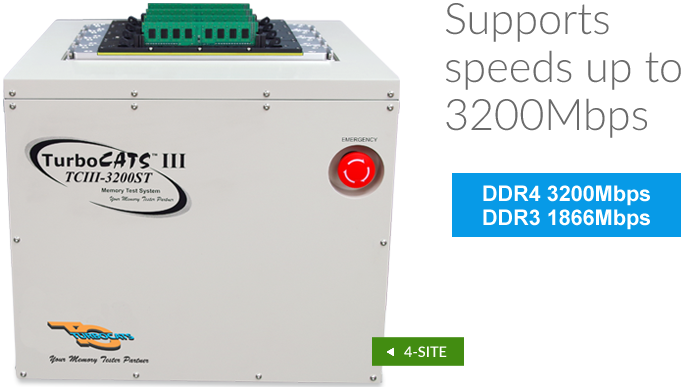 The DDR4 technology is quickly progressing and tests multiple modules that is critical to cost effective memory. TurboCATS is innovating with the new TCIII-3200ST DDDR4/DDR3 multi-site test system that will test 4 modules in parallel. 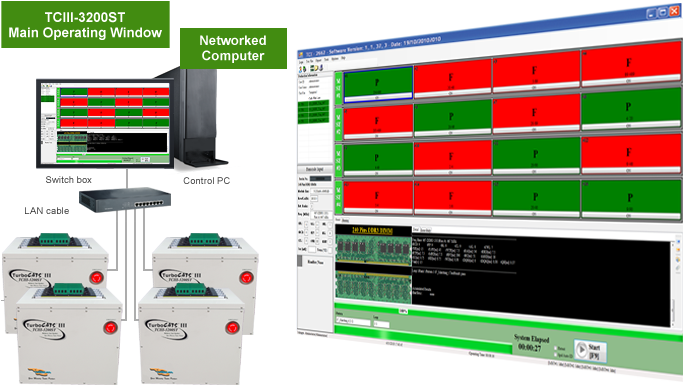 The new TCIII-3200ST multi-site unit can be networked so the user can test up to 64 modules in parallel using only one PC to control the entire operation. This allows the user greater flexibility in terms of increasing testing capacity on an as needed basis. 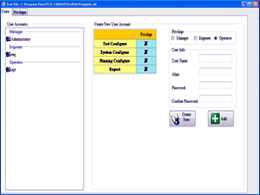 The user can add new testers when they need the capacity. Cost are minimized since there will be no need for additional man labor to handle the increased capacity. The user can simply integrate the new unit into their existing network and utilize the PC that is already in place. 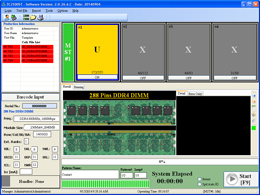 The TCIII-3200ST DDR4 and DDR3 module test system can be configured to 8, 16, or 64 sites and integrated with the handler interface to support automated handler testing. Supports SPD Programming, Read/Write test, write-protect and etc. 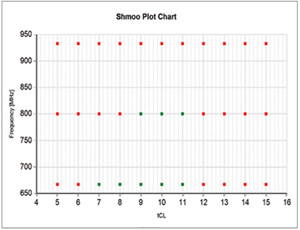 Shmoo Plot is a two-dimensional diagram showing the status of the DQ bit of memory modules varying over a range of the user-selected parameters (timing and input voltage level). 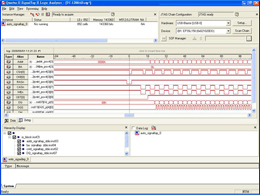 Bit failure mapping is a tool that finds and displays the failed DQ bits in the RAM. The failed DQ bits will be spotted and displayed in the corresponding row and column address with the aid of the diagram. 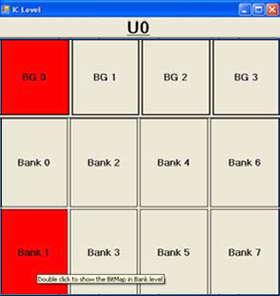 The failed bank is spotted and then the user can find the location of the failed DQ bit when the user double-clicks the failed bank. 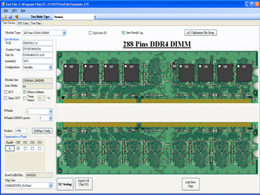 TurboCATS designed a new feature called the Script Code in the new DDR4/DDR3 test system, the TCIII-3200ST test system. 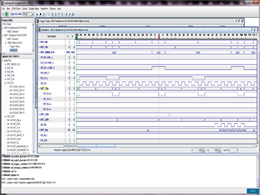 In the new system, the user can use the script programming language to create a customized test pattern. It can support up to maximum 2048 data patterns (optional). 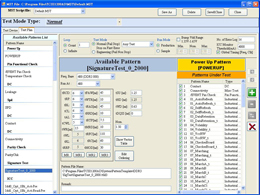 Once the pattern is created, the Script Code pattern generator/compiler is used to compile the code and then generate the new test pattern. 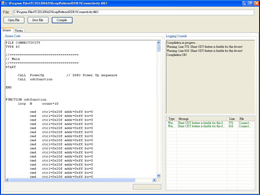 The Script Code function also serves as a powerful compiler/debug tool. It contains a built-in compiler and debugger for the Script Code programming which allows the customer to monitor the timing waveform of the programming algorithm as well as the timing bus transactions. This is all accomplished under the Signal Tap tool. Contact This will detect any open pins on the contacts between test sockets & ICs before the functional testing begins. It will also detect any open pins on both passive and memory components on the PCB. Leakage This will detect the leakage current (in and out) of the IC pins. Connectivity This will detect shorts on the signal line as well as the proper values of resistor packs and discrete resistors to ensure that proper values are used in all places and are properly mounted. 12V Pin (optional) This will detect shorts on 12V power pin of DDR4 (NVDIMM) during the Initial Test. Variable Timing Edges tSU/tHD, tWD, tDQSS, tAC, etc. Programmable Timing tRCD, tCL, tRL, tWL, tAL, tRP, tRFC, tWR, tCWL, etc. 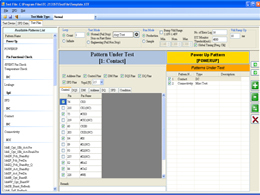 SPD Operations Read, Program, Edit, Test, Byte Matching, Serialization, Write Protect, Slot Test, etc. External PC Requirement Execute TC-3200ST software to control station operation. NOTE: The PC configuration will influence the testing efficient. The heat chamber creates a hot testing environment to simulate the accelerated life testing and analyze the behaviors of the module. 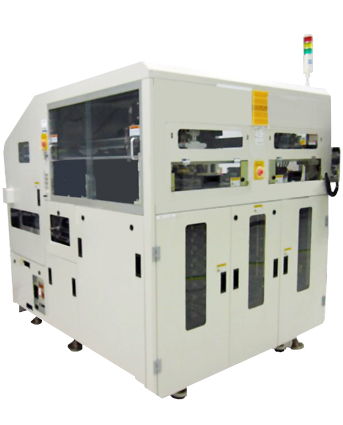 To assist manufacturers, and integrators, TurboCATS has developed a heat chamber that can be integrated with the TCIII-3200ST DDR4/DDR3 multi-site test system. This allows the module and its components to be tested while being exposed to heat conditions similar to what might be encountered in a PC laptop. Display Accuracy F.S ±0.5% rdg ±1 digit based on SV or 3°C Max.